Howlin' Wolf Records: SIX STRINGS: BORIS SALCHOW COMPOSES ECLECTIC CINEMATIC SCORE FOR INSOMNIAC GAMES' "SUNSET OVERDRIVE"
BORIS SALCHOW COMPOSES ECLECTIC CINEMATIC SCORE FOR INSOMNIAC GAMES' "SUNSET OVERDRIVE"
Los Angeles, CA (October 27, 2014) - Composer Boris Salchow (Ratchet & Clank: A Crack In Time, Fuse, Resistance 2&3) continues his long-standing musical collaboration with independent video game developer Insomniac Games to score the cinematic music for their highly-anticipated next-generation shooter, "Sunset Overdrive," published by Microsoft Studios. Reflecting the game's over-the-top sense of humor and frenetic gameplay style, Boris Salchow's eclectic cinematic score ranges from electro-industrial, alt-rock, spikey punk and headbangin' metal cues to '60s Hollywood orchestral music, zombie horror, spaghetti western and even minstrel ballads! "Sunset Overdrive" will be released worldwide exclusively for the Xbox One starting October 28. Filled to the brim with Insomniac Games' trademark humor and satire, "Sunset Overdrive" is a rebellious game that explodes the rules and flips modern conventions of post-apocalyptic shooter video games on their head. 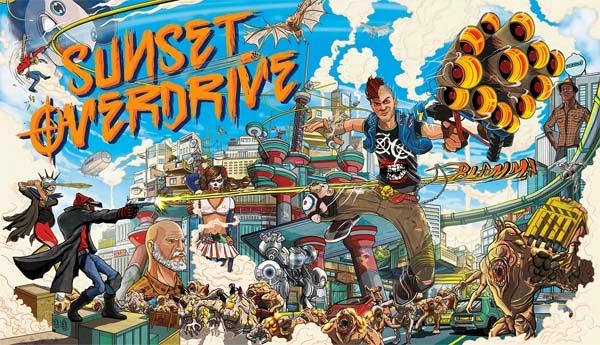 Winner of IGN's E3 2014 Award for Best Xbox One Game as well as nominations for Best Original Game and Best Action/Adventure Game at the Game Critics Awards, "Sunset Overdrive" is one of the most anticipated video games of 2014. For more information on "Sunset Overdrive," visit www.sunsetoverdrive.com. German-born composer Boris Salchow is classically trained but his artistic range and versatility encompasses hybrid acoustic and electronic music, immersive musical sound design as well as live orchestra. Combining these worlds he began his scoring career writing commercials, promos and prime time television series for leading networks in Germany. Now based in Los Angeles, Salchow has composed for feature films and video games including the internationally-released action thriller 80 Minutes, additional music for Elsewhere, and additional music for the Sony/Screen Gems teenage horror mystery Prom Night. Salchow 's music can also be heard in Ubisoft's Rainbow Six: Vegas 2, Sony's Resistance 2, Ratchet & Clank: A Crack In Time, and Resistance 3. Recorded with A-list musicians at Abbey Road Studios in London, Salchow's dark, emotional orchestral score for Resistance 3 was hailed as one of the top video game scores of the year by Classical MPR. Salchow continues to write music for commercials, promos and trailers for some of the most prestigious brands in the world including Adidas, Audi, and Lamborghini. Salchow's score for the feature film adaptation of the award-winning documentary series Germany From Above (Buena Vista International), recorded with a 70-piece orchestra and mixed at Babelsberg Studios in Berlin, is currently touring in live music to picture concerts throughout his native country. This visually stunning film is comprised of breathtaking aerial shots of Germany. With only a few words from the narrator, the movie provided a unique opportunity to take the audience on an inspiring musical journey befitting the film's grand scale. Following the success of the movie's premiere at Germany's largest movie theater, and other sold out shows, more live dates have been announced including upcoming performances by the Munich Symphony, Nürnberg Symphony and Stuttgarter Philharmonic. For more information on Boris Salchow, visit www.borissalchow.com.